The video we did at the Winter 2016 TNNA show was finally uploaded to the TKGA website this week. TNNA is the major trade show for the needlework industry. The major yarn companies have booths to show off their product lines for retailers. We used to review new products in Cast On but we decided not to do this anymore. We are going to produce a video with this information and review some of the yarns used for garments in the magazine. This year we reviewed needles from Hiya Hiya and yarns from Baah, Shibui, Anzula, Mountain Colors, Jade Sapphire, and others. Here is a link to the video: TNNA Winter 2016 Product Review (Scroll down the page a bit to see the link to the video). It has been slow. I've noticed that March is always slow. I don't know if it because of Spring Breaks, tax season or March Madness (a bit of a sore spot here in Lexington right now.) I'm ready when you are! This week's tip is a special request. I had an email from someone requesting help on this topic. It can be confusing for a new knitter or someone who always works in the round. Patterns often use a type of shorthand to save space and the knitter was puzzled by a particular phrase. The instructions for Left Fronts typically are spelled out but when you get to the instructions for the Right Front, the pattern generally says "Work as for Left Front, reversing all shapings". The knitter was working on a baby sweater and was very concerned about the armhole shaping. I remember having this same difficulty with the first sweater I knit. The first thing to know is that Left Front refers to it being on the left WHEN WORN, not as you are looking at this while knitting it. The instructions for shaping the armholes generally state to bind off X number of stitches X times at the armhole edge and then to decrease a stitch every other row or so. When you do this on the left side, you will be binding off on the RS of the work. When you go to bind off the armhole opening on the right side, you will be binding off on the WS of the work. The problem the knitter who contacted me had was that this meant that the Right Front would have one row more or less than the Left Front up to the armhole opening and was that a problem. No. That is just how it is. If you look at the photograph below, the Left Front is on the right. 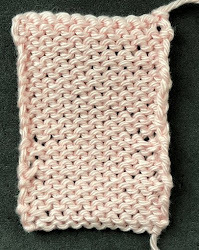 Notice that it has more rows before the bound off stitches. The problem will be reversed when you shape the neckline. On the Left Front you bind off on the WS. In this photograph, this problem is exaggerated since it is such a small sample. I can assure you that in an actual project, once sleeves are sewn in and bands are picked up, you will never notice this. The other thing to be aware of when reversing all shapings is to mirror your decreases and increases. I won't be having salon this week as I will be out of town. The next Salon will be on April 3rd. I'm still working on the sweater for Elff. The front is almost finished. I can see the light at the end of the tunnel. The stars go much quicker than the trees or fish. The sleeves won't take that long. I need to remember to order clasps!